With my Roman Villages in Server 10 were in an end-to-end locations, particularly, north-west and south-east, as explained in Part IV, it really took toll in my playing strategy. While the South-eastern Villages, namely: namely 0 (the new Capital), 1, 2, 3 and 4, were deliberate on my part; the north-western Villages, 4., 5, 6, 7, 8, 9 and the conquered village, 9., from a former WK 99! member, were created in order to survive the Natars. The thirteenth village, WW, was created to support Lord Aslan’s quest to build and defend his Wonder of the World. The following snapshots were taken on the day when Travian 3.6 on Server 10 ended. 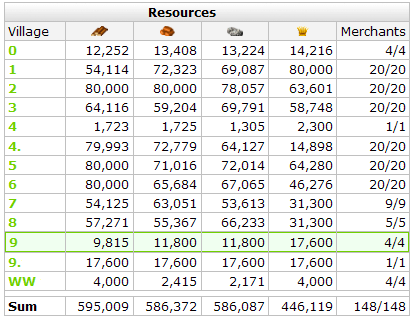 In terms of Resource production, six of the thirteen Villages have already maximized all the resource fields. 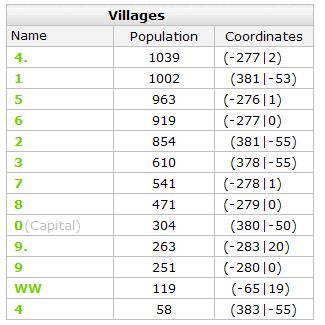 Village 0, the new capital, because it was created less than two months before Server 10 ended, the resource fields only reached level 7, while one field for each type reached level 10. Moreover, the Trade Offices for six Villages were maximized to ferry more resources among the villages. In terms of Warehouse and Granary capacities, Villages 1 and 4., being the primary Village for south-east and north-west, respectively, have been extended to hold more resources than others. 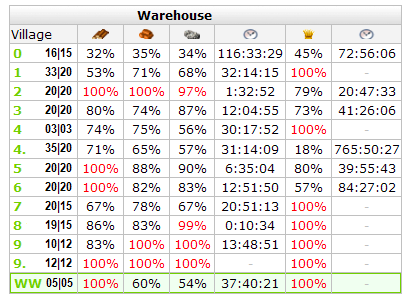 In addition, four  Villages, namely: 2 and 3 in the south-east, and 5 and 6 in the north-west, have their respective Warehouse and Granary capacities maximized to level-20. All thirteen Villages produced a total of 7,085 culture points per day. These culture points are necessary for the realm’s expansion. 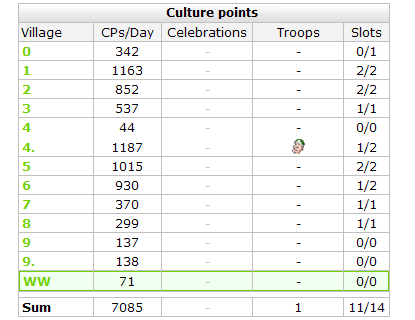 To settle another Village, my account would need 584,000 culture points. When the server ended, my account had a balance of 840,175 points and one  senator was left on stand-by in Village 4., which fortunately had one  slot left. Residences in five Villages were already at level-20, while the Palace in the new Capital at level-10 and still one  slot left, and the Senator had already been researched. 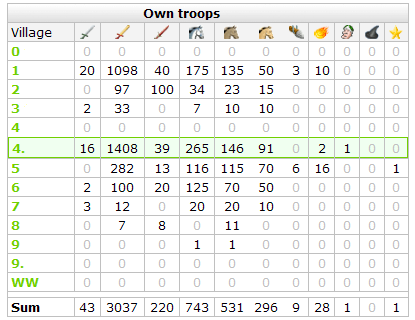 For troop count, although spread thoughout, the Villages had some 3,000 Praetorians and about 300 Equitis Ceasaris for defense (mostly with level 20 Armor and Weapons), aside from those defending Alliance members. For offense, the Villages only had a total of some 200 Imperians, about 700 Equitis Legati and 530 Equitis Imperatoris. Most of the Rams and Catapults were spent conquering Village 9. prior to the end of the server.